Shakib told the committee, which features the likes of Ricky Ponting, Brendon McCullum and Kumar Sangakkara, that numerous younger Bangladesh players were no longer viewing Test cricket as their goal due to the greater financial security afforded them by T20. My view: I don't agree with Shakib's take on this. Frankly, I would've liked to see more passion from our test captain about the game as opposed to just money. Test cricket, for some people, is love for cricket. The ultimate form of cricket. I don't agree that young Bangladeshi boys don't want to play test cricket because of money. On the contrary, I think most cricketers would be privileged to play test cricket. Maybe not in West Indies (No offense Aklemalp) but certainly in BD. As for salary gap, what is the average salary for someone in BD? Making $140,000 is a lot of money for many. It's unfair to compare to Australia or UK. What is the average salary in those countries? How much is a ticket to watch a game cost? What about cost of daily needs (rent, groceries, etc.) ? Totally agree with Shakib on this. 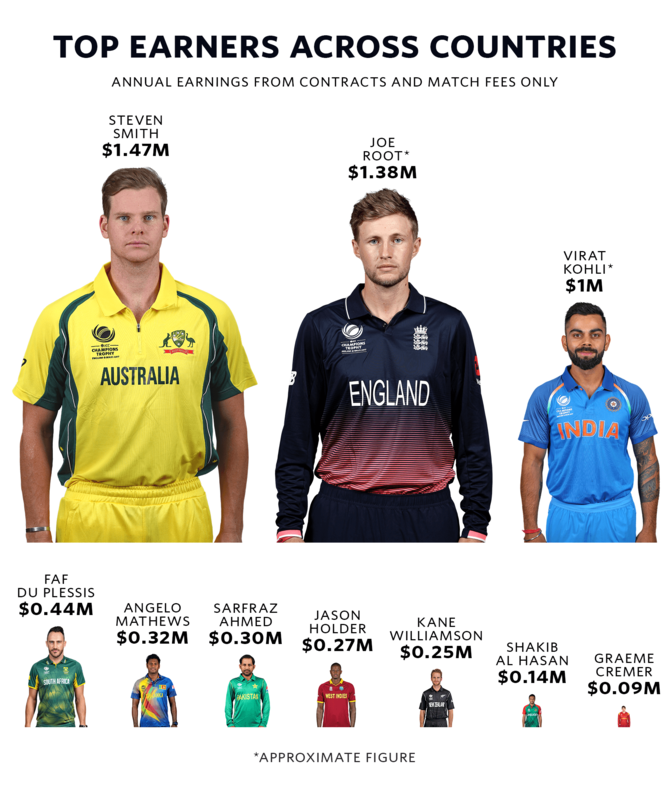 Cost of living in general is not that much in South Asia compared to developed countries, so Kohli and co I think earn more than satisfying amount of money and considering they are gonna get a huge pay raise soon so I guess BCCI is taking care of the cricketers financial aspects quite well. Eng and Aus are rich boards and always pay big but I am quite surprised to see Mathews earning more than Sarfraz, Shakib and Williamson. BTW why does Root always look so depressed? A millionaire with expression and body language of a homeless. Because he just saw what Smith is earning. Shakib is stressing the fact that there are far greater monetary incentives playing for T20 franchises over tests for the national team. If anything, he's drawing attention to a genuine problem with the financial structure of cricket in general. Teams like Bangladesh are desperately trying to gain recognition as a quality test outfit, yet losing potential players to franchise cricket. Just answer this for me. If Shakib gets injured tomorrow and can no longer play cricket, will you support his family? Im guessing no.Then how can you say that players should play for the love of the game. It's very easy for fans to expect players to put country first, but that same country won't give a crap when the player is done playing and is in financial trouble. A cricketer has a short window in which to earn his living. From the age of 20 - 38 is when a cricket can play. Whatever they earn during that time will have to support him and his family in his 40s, 50s, 60s. You can't blame them if domestic T20 allows them to put more in the nest egg. Test cricket imo is unsustainable in the long run. Money talks, and I won't blame any Bengali cricketer if he opts to get paid more in IPL than the peanuts BCB chooses to pay him. Completely agree, and if you see the pattern it is mostly those don't get contracts or retired cricketers who are whining. Windies declined because of the incompetence of their board, it ridiculous to blame the cricketers or franchise leagues. I get what you are saying. Money matters. But money is taking the true passion and fun out of it. Think about it, Wasim Akram, Ranatunga and Ganguly was not paid as much during their playing career but sure played with their heart out. I miss that passion. It's true. But back then, these players didn't have any alternatives. It was national team or bust. Also, coincidentally, each of the guys you mentioned has had a second career after cricket - either TV host, coaching, and politics. I'm sure alot of players still have that passion to bring honor to the country, especially our boys. But as the difference in pay between national contracts and T20 leagues gets worse, a lot of players will be making tough choices. We see it already with early retirements, kolpaks, etc. 1) ICC has to force each Board to use a fixed percentage of its revenue strictly on player salaries. At the moment, it's left entirely on each Board, and that's where you see a lot of discrepancies. there will still be inequality in pay, but at least a lot of players will be paid a lot more than what they are paid now. 2) Divide the calendar between international cricket and domestic T20 leagues, so that one doesn't interfere with the other. That way players don't have to consider leaving national team for money. the figures are slightly misleading from BD context. 1) cost of living disparity between Eng/Aus/SA with the subcontinental teams. 2) top countries (Aus/Eng/Ind) plays the most number of test matches. That's why they make more through the match fees. then how come even Pak and SL makes more money than BD? 2) because historically BD players made money through DPL. Our cricket developed through DPL and it is the club circuit that is the bread and butter for our cricketers. Elite players like Shakib/Tamim/Mushy makes around 40 lakh and more per season easily. I completely agree with what Shakib has said. I must also add that there needs to be a bit more context here. Shakib earns 140k USD per year from his main employer. Now obviously he earns a lot from sponsorships and domestic tournaments, Infact he earns almost 50 times more from other sources. But even 140k USD is not a bad amount. Now 140k is a good salary for someone working as a banker, engineer, etc in the US. But in Bangladesh 140k is nearly 1.2 crore or so, around 10 lac per month. 10 lac per month is a pretty damn good amount in Bangladesh context. That's enough money to be able to send your child to top schools or tuitions, buy expensive make-up or clothing for wife and live in an expensive house. In Australia though, with 140k USD you would barely be comfortable with that amount. I see the argument about Shakib,he is a match winner. But being 9th in tests and 7/8th in one dayers,apart from 4/5 players,of course they will get rubbish pay. The TV rights for Bangladeshi series is low when the 3 main countries is high.The reason for not much for the players. ATM Bangladeshis are proving mediocre,apart from 4/5 players. On Shakib on T20 he is tired out by his T20 load,and skips important series. Thats why I agree with the BCB has limitted in to 2 T2o series,because you can't have ppl skipping important series just because T20 tires them out. Until Bangladesh improve then they can't expect anymore.The last year is a downer on one dayers. One question worth asking, is suppose the pay gap is minimized, and BD players do end up getting paid a lot more. Although the stats here provide a gloomy picture for BD cricketers, i wonder what ll happen when you take their commercial interests into context-advertising, endorsements, business ventures. We might see our players are not bad off after all. Pay scale system does need a re-look, but so does the other factors. There will be more T20, T10 etc competitions in the near future. national payscale in my opinion is fine. It's the salary below the national team is what I want increase on so cricket can be a viable career even if you don't make the national team. very few will make the national team and it may not be a risk worht taking if the payscale can not compensate a livelihood if you don't make it there. While I understand shakibs concern, i disagree with him. No need for national team salary to exceed exponentially in relation to salaries at domestic competition. Being in national team has other perks - fame, world travel, advertising.. etc etc. shakib earns a lot of money so his thinking is foreign now i think. money is not everything in life... there are players who genuinely love Bangladesh and cricket. I never heard mashrafee ever talk about money. Paul Sterling signed a 4 year contract with Middlesex,he will be unavaiabke from 2019,because Irish players will be considered overseas players. I agree partially with Shakib. In BD the service and goods are lot cheaper than Australia. So if we consider the purchasing power, the gap between Smith and Shakib will be reduced. But, I agree with Shakib when compared with Pakistan or Sri Lanka. BCB is richer and the BD cricket market is also stronger than these two (Pak is weaker because no country visits them). So there are no reasons for Shakib to get less from Pakistani or Sri Lankan players. All of you that keep talking about purchasing power and cost of living in BD are missing the point. National team contracts shouldn't be compared to the average salary in BD, it should be compared to what the player can potentially earn playing in T20 leagues. This isn't a problem yet because we really only have Shakib. But it will be a huge problem in the future. We've gotten to the point where every month of the year has a T20 tournament going on. Someone like Ronchi, Shakib, Narine, could easily play in all these leagues. You don't need to have a national contract to play cricket year around. A BD cricketer that's good enough could easily earn a lot more money playing T20 leagues instead of the BCB contract. That is the main issue. Shakib leaves a lot of money on the table everytime he has to leave KKR to play for BD. Count our lucky stars that he still places value on the national team. But future BD cricketers may not care as much, especially if they are not getting any endorsement deals to subsidize their salary. BCB has to pay more to their national cricketers so that those T20 leagues are not as attractive. This is not a problem for Aus, Eng, Ind, because their national contracts pay as much or higher. That's the difference. what some have failed to grasp is the fact that Shakib is not just talking about himself. How much do others get paid except for Shakib, Tamim and one or two other players? Indian players who have never even played ipl earn as much or more. Some were talking about the selfless love for the game by wasim akram who was the biggest match fixing beneficiary in Pakistan. The fact that match fixing became an epidemic in the 90s was indirectly because of low wages. What Shakib wass focusing on was that cricket boards need to pay test players enough so that they don't have to depend on ipl or any other club league for money. Bangladeshi test players of the current team may not leave but the next generation will certainly do if given the opportunity like West Indians have. What he gave was a warning for the future and something ICC and BCB must consider seriously. Most of the player from Bangladesh (and SL, Pak, etc.) will get a chance to play in those T20 leagues when they become stars and visible by playing for the national team. So without playing Tests, ODIs, & T20s for national team, it will be hard for most of the players to get a contract to play in T20 leagues. Mustafiz only got an IPL contract after playing for BD. Shadav Khan got Big BB contract after playing for the national team. Without playing for the national teams, it will hard for the players to be know outside their countries. Not only that, the boards also invest a lot by providing facilities, coaching, etc.,. In a country like BD, it will be hard for any players to get those services on their own. Without playing for the national teams they will not be able to earn the temperament they need to play in those high pressure T20 leagues. So I do not think any players in BD (except few players like Shakib, etc) will leave national team for T20 leagues. There will always be big gap in age between old/senior cricketers and the new young ones. Look at the retired cricketers, they are very old, some even died (RIP). In the mean time, there will always be under-16, 19 so on, young men playing cricket. Listen age is nothing but a Numba...just like Aretha Franklin said.